Home to famous beach holiday destinations Cancún, Playa del Carmen, Cozumel and Tulum - which has its own impressive Mayan archaeological site built into the coastal cliffs, Quintana Roo’s jungle interior has some wonderful Maya-Mexicano communities, as well as the spectacular ancient sights at Coba. 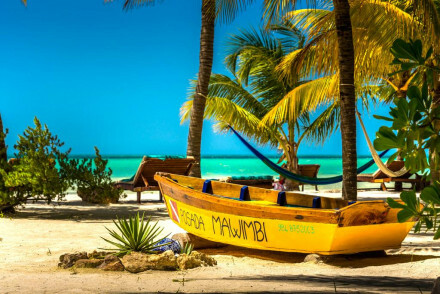 The region’s tourist appeal is relatively new, dating from the 70s, and one of the best things about Quintana Roo is that away from the tourist areas it feels unspoilt and has been largely protected. Indulge your inner thrill seeker at one of the region's several theme parks - there's something for everyone at these parks, from swimming with dolphins to zip lining. Experience a historical marvel at the Ruins of Tulum, the site of a Maya walled city. The ruins are perched dramatically on the cliffs making for a sensational views. Journey into Rio Secreto - a system of underground caves and rivers dramatically lit revealing all the ancient rock formations. There is a professional photographer following visitors through the caves ensuring memorable snaps aplenty. Pay a visit to the crystal clear waters of Lake Bacalar with stunning views in all directions. Visitors can also hop on a boat tour and see various impressive cenotes (sinkholes or natural pits). Dive at the Palancar Reef - a beautiful reef with a hugely diverse range of fish and coral formations. The water is wonderfully clear making it easy to spot all the different subsurface sights. 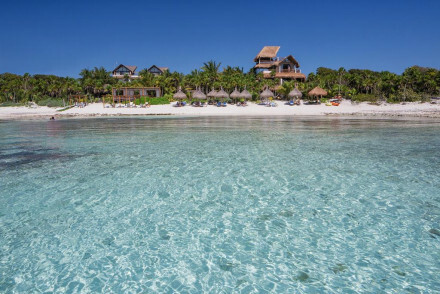 As you might imagine the majority of the best places to stay in Quintana Roo are in the tourist hot spots, but our Gurus have found some real treasures. And if you’re looking for a peaceful jungle escape or a chance at secluded barefoot luxury then you’ll find your dream hotel on our Guru’s list too. 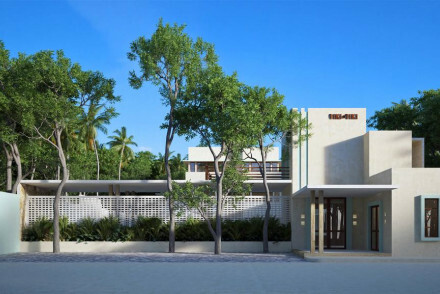 If you like the idea of a small property right on the beach then Encantada Tulum is a for you. There are just eight rooms and you’re set directly against a pristine stretch of white sand. The large terraces have incredible sea views and inside the deco is simple and chic with plenty of wood. 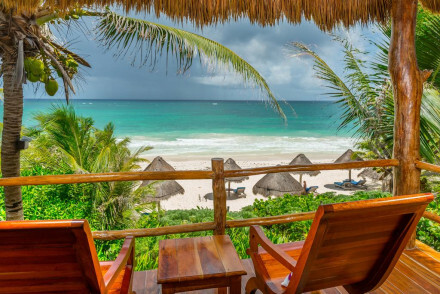 Nomade Tulum is a 38 room hotel in a stunning, beachfront spot. The accommodation is in a range of rustic tents, villas and suites. There’s a retreat feel to the place and a great vegetarian restaurant. 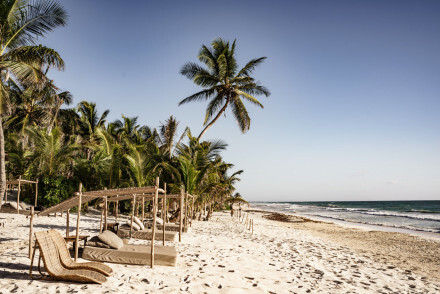 There are plenty of hotels right on the sand in Tulum, but Ana Y Jose Hotel is in a great spot even for Tulum’s standards, close to one of the best sea swimming spot along this stretch of coast. There are 23 rooms and an exotic spa to top it off. 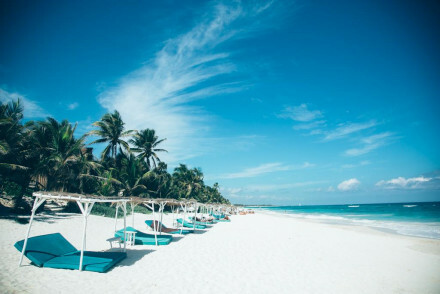 Tulum’s The Beach demands to be included in this section of the list, with 28 boho-chic, white-on-white rooms and lovely views just steps from a secluded stretch of white sandy beach. 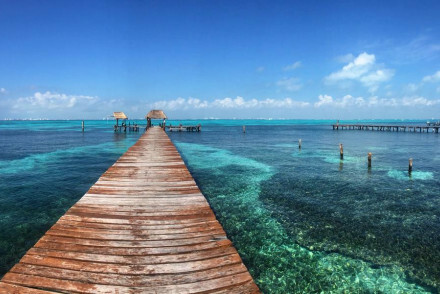 The Nizuc Resort & Spa has a beachfront spot on the Punta Nizuc, which is just out of Cancún proper, and offers panoramic views of the Caribbean. This is a big hotel - with 274 rooms and suites - with chic, contemporary decor, a luxurious spa and a choice six onsite restaurants. 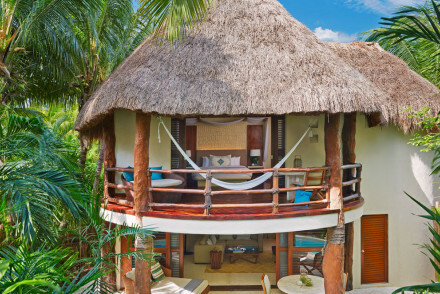 Tulum’s Mezzanine is a nine room, eco-friendly resort beside a secluded beach. There are tropical gardens and breathtaking sea views, plus plenty of activities on offer. 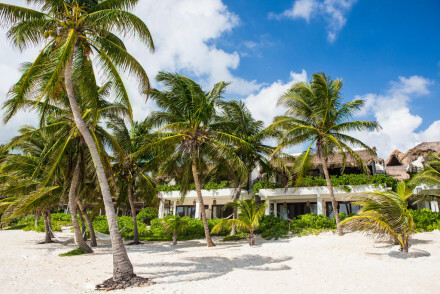 Tides Riviera Maya in Play del Carmen is a well secluded collection of 41 beautiful private villas surrounded by tropical forests - the only thing between you and the perfect white beach. As well as the beautiful beach this resort has private pools with beach views and an incredible spa which draws heavily on Mayan traditions. The restaurant is a fusion of Mediterranean and Mexican. 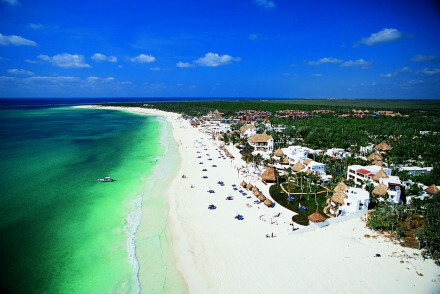 The Belmond Maroma Resort & Spa is a 64 room hotel sitting between one of Playa del Carmen's best beaches and the jungle. 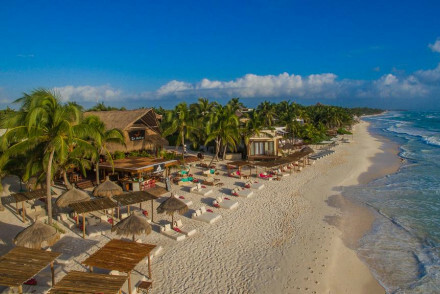 Maroma has amazing facilities including numerous pools, a beautiful spa and access to yoga, snorkelling, diving, windsurfing kayaking, riding, fishing, surfing and everything you need to get married. 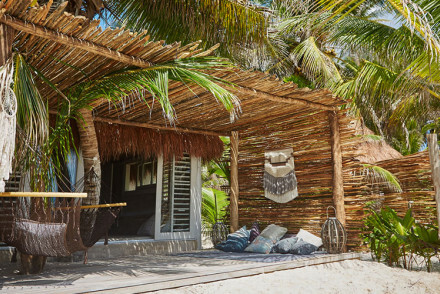 Tulum’s Casa de Las Olas is a seven suite boutique deco-hotel on its own private beach. Rooms are traditional and decorated in white and the atmosphere is one of intimacy and peace. No children under five. 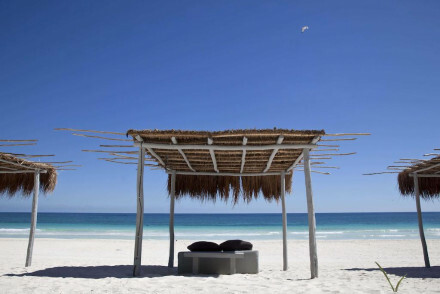 Also in Tulum, Jashita is a luxurious beach-side propter overlooking glittering turquoise waters. There are 26 indulgent suites decorated all in white plus spectacular views and excellent Italian/ Mexican fusion restaurant. 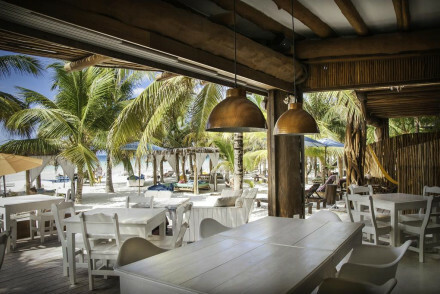 The Hotel Secreto is on the Isla Mujeres, just off the coast of Cancún and is a luxurious, 12 room boutique hotel in an extremely private spot overlooking its own private beach. The rooms have floor to ceiling windows overlooking the infinity pool and the beach and are decorated with original art works. Apparently the bar serves dangerously good Margaritas. 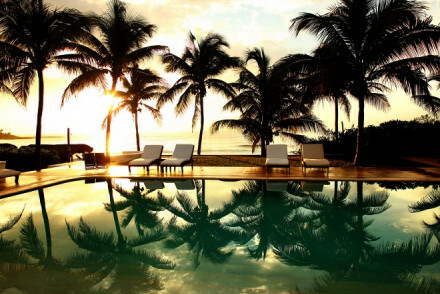 Just outside Tulum, in a beautiful beachfront spot, Sanara is a low-key hotel with 19 rooms and suites and a great spa. There’s also a superb restaurant perfect for before or after your post-sunset-beach-stroll. 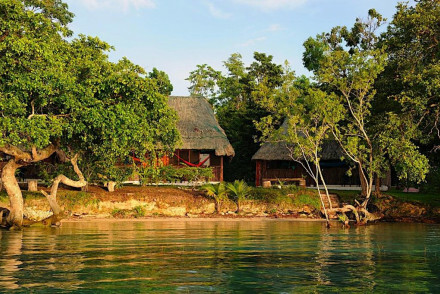 Lake Bacalar’s Rancho Encantado is a collection of 12 chic cabins nestled right in against the lake. The terracotta tiles, muslin-draped beds and white-washed walls give a rustic feel but there’s plenty of luxury, including a beautiful spa. 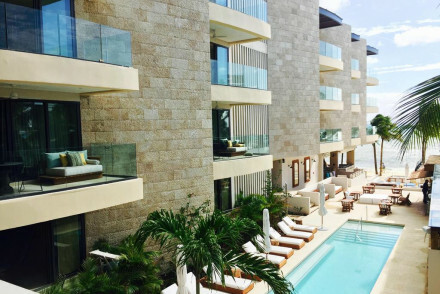 Deseo, in the centre of Playa del Carmen, caters perfectly to the young, cosmopolitan crowd with a stylish rooftop pool and terrace bar, plus hammocks on all private balconies. It's also just two blocks from the sea. 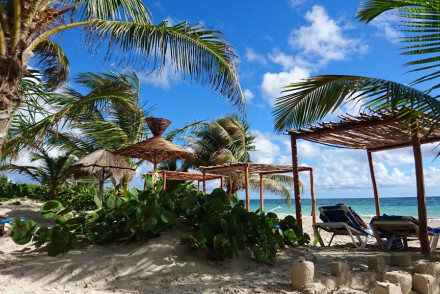 Tulum’s Casa Malaca is a trendy private-beach-side hotel with 40 rooms and suites, three pools and a lively bar. The decor is white one white and contemporary fabulous. Soho Playa is in just the right district of Play del Carmen, surrounded by cool bars, good shopping and a hip vibe - and all just a few steps from the beach. They help you get into the right frame of mind with yoga and meditation in the mornings. 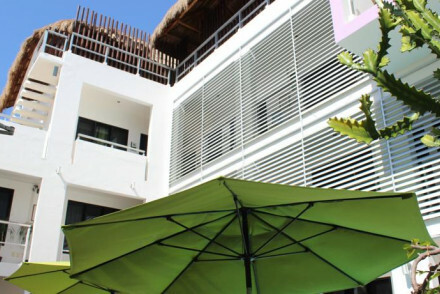 Playa del Carmen’s Casa Ticul is a relatively new 20 bedroom hotel with traditional decor and all the mod. cons.. There's a small outdoor pool and you're well located for exploring town and the beach. Rooms start from less than £50 per night. Also in Play del Carmen some of Hotel La Semilla's nine rooms start from less than £70 per night. This is a more stripped-back and fashionable property with well chosen flea-market furniture and no TVs. 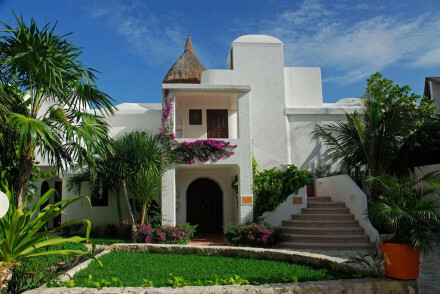 The Zamas Hotel is a laid-back 20 room property on one of Tulum’s most beautiful stretches of beach. The decor is rustic chic with wooden furniture in sort-of-tile-floored-huts! 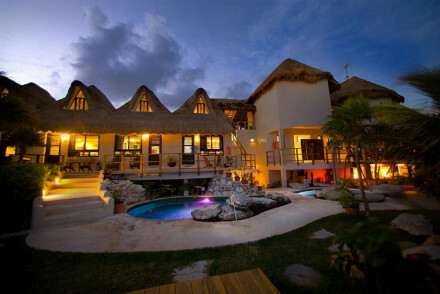 There is a private villa for families and the restaurant has great traditional Mayan fare. Rooms start from around £90 per night. 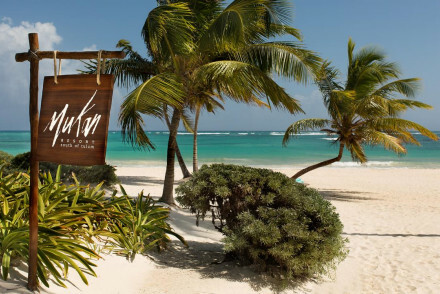 For around £100 per night you can stay at Tulum’s Hotel Tiki Tiki, a 15 room boutique hotel in leafy surrounds. 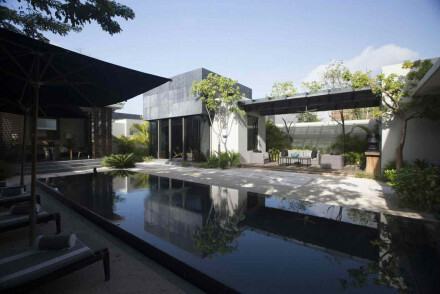 The decor features plenty of glass and minimalist design. 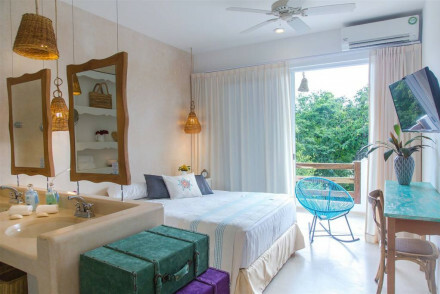 Be Playa in Playa del Carmen is a chic boutique property with contemporary rooms with wood floors, hot tubs and excellent views. 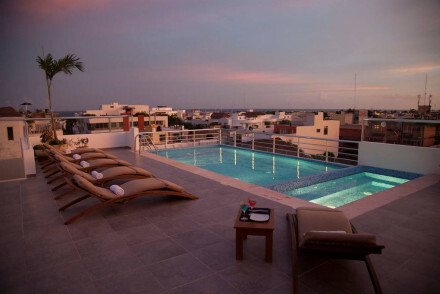 There is a rooftop pool, a hip bar and a creative seafood restaurant. If you'd prefer a self-catering option this holiday, visit our online partner Booking.com for a great selection of coastal properties ideal for making the most of the golden beaches. Fly to Cancún International Airport - the largest airport in the region located only 17km (10.5 miles) outside of Cancún. The airport serves a range of domestic and International connection and has bus connections to downtown Cancún. Best time to visit - from December to April typically provides fantastic weather, perfect for enjoying all the beaches and outdoor activities. It can get busy though, especially from March to April when the springbreakers arrive. 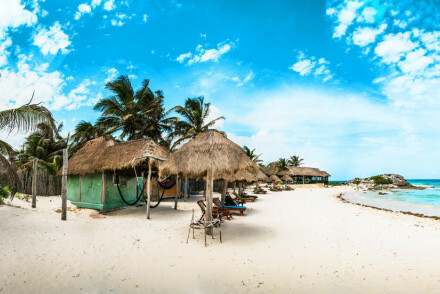 A secluded and peaceful stretch of paradise, on the stunning Costa Maya. 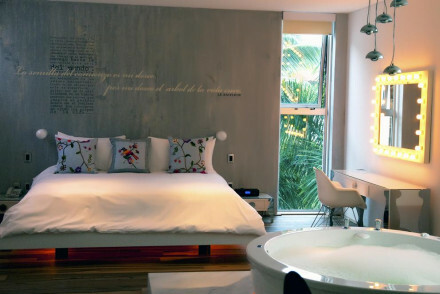 White on white suites offer sumptuous beds, private balconies, splashes of local art and colourful Mexican tiles. An excellent restaurant serves Mediterranean-Mexican food overlooking the crystal clear waters. With its own stunning private beach this hotel is a relaxing retreat. Has its own pool, restaurant and bar as well as spa facilities ideal for unwinding after a day on the sea; beach yoga, gourmet dining, cocktails with music sessions on the floating bar, pool, gardens- there is something for all. A colourful boutique property surrounded by palm trees and set on a white sandy beach. White washed rooms are the epitome of boho-chic with natural materials and bright fabrics. Dine on Mexican delicacies and sip cocktails whilst admiring the sunset. The perfect spot for totally unwinding. Beach Life - Located on an island that captures the tropical dream. Birdwatching - Visit Isla Morena (Bird's Island) and admire the many different varities including flamingoes. Diving - Learn how to dive with PADI certified instructors. Kayaking - The hotel provides kayaks free of charge. 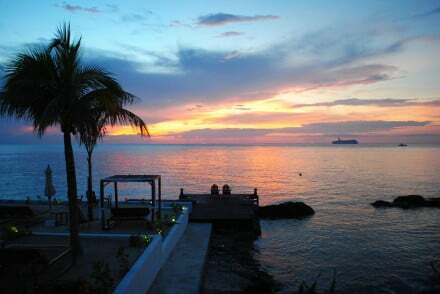 An intimate and indulgent resort on the tropical Isla Mujeres. The sweet rooms offer private balconies, dark wood furnishings and scatterings of handmade local crafts, cushions and blankets. Overlooking the turquoise waters is the excellent restaurant GRILL, where there is often music and dancing. 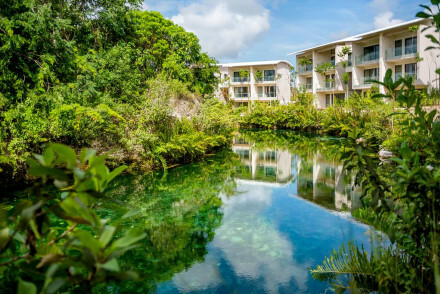 An enchanting eco-lodge nestled amidst thick vegetation and overlooking Lake Bacalar. Chic cabins feature terracotta tiled floors, muslin draped beds, white washed walls and pops of turquoise. Plenty of hammocks, a spa and utter tranquility ensure a restful stay. A glorious hideaway. Eco break - Rest assured the hotel is taking care of your carbon footprint leaving you free to totally unwind. Hideaway - Great for couples wanting to get away from the world. Right on the beach and surrounded by jungle, this is an ideal destination for nature lovers and active types, with all activities and tours arranged by the hotel included in the price. 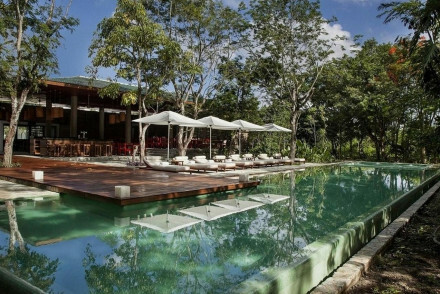 With its own bar, restaurant and pool on site, a perfect base to unwind with rooms situated in stand-alone casitas. A small boutique property offering the ultimate in laid-back island life. 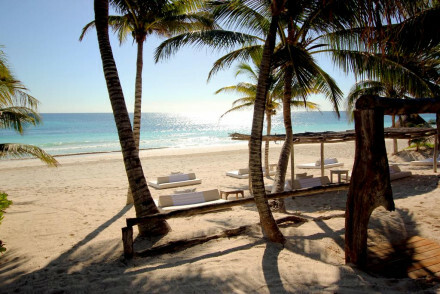 Swinging hammocks, white washed rooms with linen draped beds and just steps from the perfect white sandy beach. A restaurant specialises in seafood (naturally) and cocktails are served in the pool-side bar. Paradise. Beach Life - Think cocktails, hammocks and white sandy beaches. Sailing - Take a boat trip in search of the enourmous whale shark. Birdwatching - Head to Isla Pajaros, a veritable birder's paradise. A tropical paradise complete with swaying palm trees and powder white sand beaches. Rustic chic rooms feature uneven white washed walls, beamed ceilings and luxurious bathrooms. A romantic terrace restaurant specialises in seafood. Find numerous activities on the island or simply unwind in the spa. 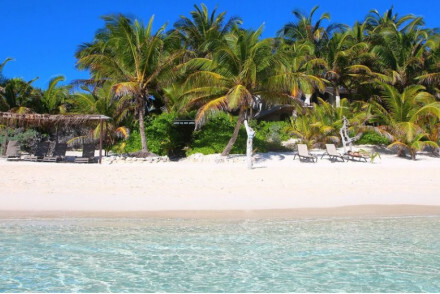 Beach Life - Located in a picture perfect tropical island and just steps from the beach. Kayaking - Explore the coast and canals of the island by kayak. 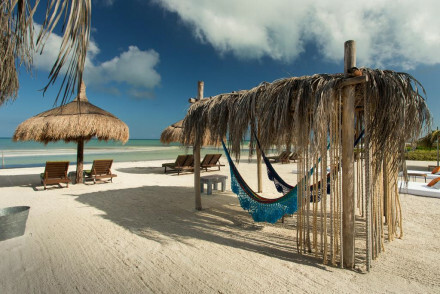 A chilled out beach retreat on the idyllic island of Holbox. 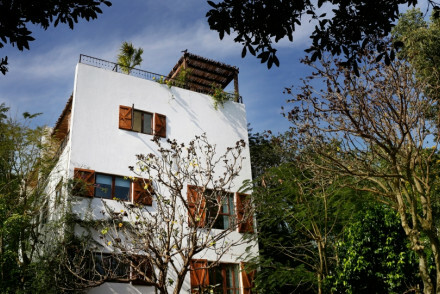 Laid back and elegant rooms overlook the courtyard and offer handmade hammocks for chilling. With a choice of three restaurants, wonderful cocktails and an incredible spa which uses local products and treatments. Ultimate relaxation. 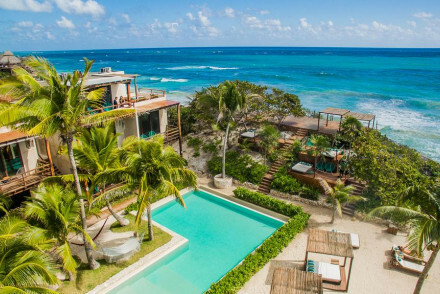 Boutique at its best, Esencia has it all: direct access to Xpu-Ha beach and two pools, you will have no end of places to sun yourself. That is if you can find the time with all the activities on offer! Simply yet stunningly decorated with an excellent menu. One for the entire family! Nizuc Resort & Spa enjoys a beachfront location on the secluded Punta Nizuc and offers beautiful panoramic views of the Caribbean Sea. This designer hotel features chic and contemporary accommodation whilst you can spend your days lounging carefree by the seaside. A luxurious and top-notch stay! 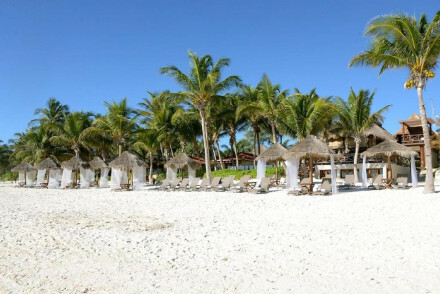 A fabulous resort set on a beautiful stretch of white sandy beach. Luxurious rooms feature king size beds, sunken baths, large terraces and the best have private plunge pools. 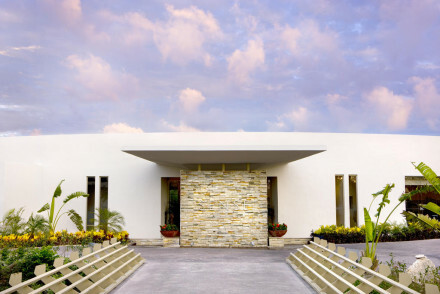 A spectacular spa is worthy of a visit alone and the Med-Mex cuisine is noteworthy too. Beach perfection. Spa breaks - Boasting a glorious spa complete with with self-serve muds, meditation pools and treatments that use local herbs and fruits. 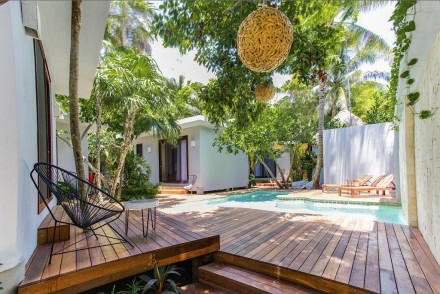 Beach Life - Located on a stunning stretch of white sandy beach and backed by lush jungle. Tropical paradise. Diving - Some of the Riviera Maya’s most spectacular reefs are right off Maroma’s shore. Sights nearby - Visit local ruins and cenotes near Chichen Itza, Coba and Tulum. 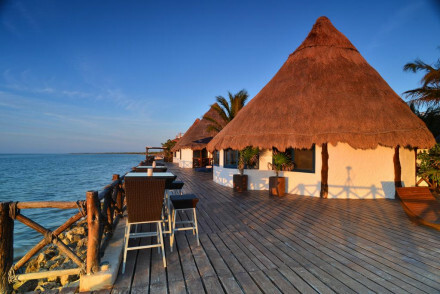 A stunning eco-resort on the peaceful island of Holbox. The rooms make elegant use of local crafts and building methods and many of the balconies offer jacuzzis. With a private stretch of beach, excellent spa services, and a range of dining options this is the ideal spot to reconnect with nature. A tranquil property set on a beautiful white sandy beach. Atmospheric throughout, find Mexican flavour in the design; think white washed walls, contemporary art and antique furniture. Just steps from the beach and boasting a stunning pool. The perfect place to completely unwind. 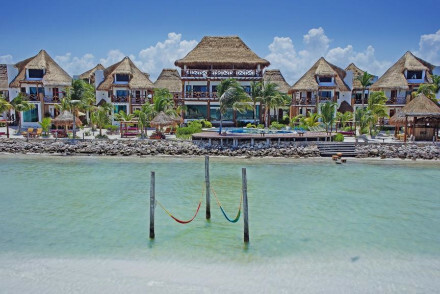 Beach Life - An authentic Mexican experience on a pristine stretch of beach. Sights nearby - Explore striking Mayan ruins.